In my opinion, jazz, both as a genre and a style to perform music, can easily be described as some abstracted outputs of complex sensations and feelings. Celebration should be allocating one of the largest portions there and the performance from Joshua Redman Trio in the festival Jazz in Duketown, here in Den Bosch, showed me one more time that how important this celebration feeling is both for jazz and life in general. For my first time in Jazz in Duketown, my overall evaluation for the festival would be the Dutch word "gezellig", which seems to have a meaning in between cozy and within-family-and-close-friends. Although the festival is known to be an entertainment-fair like event in past mostly with its outdoor style, line-up-wise it is said to be changing roles with its counterpart in Breda, which is another long standing Dutch jazz festival close by. Amongst, Al Di Meola, Ben Williams, Marcus Strickland, Mark Turner, Sons of Kemet, Jasper Hoiby, China Moses, Lucy Woodward and Dinosaur caught my attention immediately on checking the four days festival ending on the national holiday Monday June 5th. 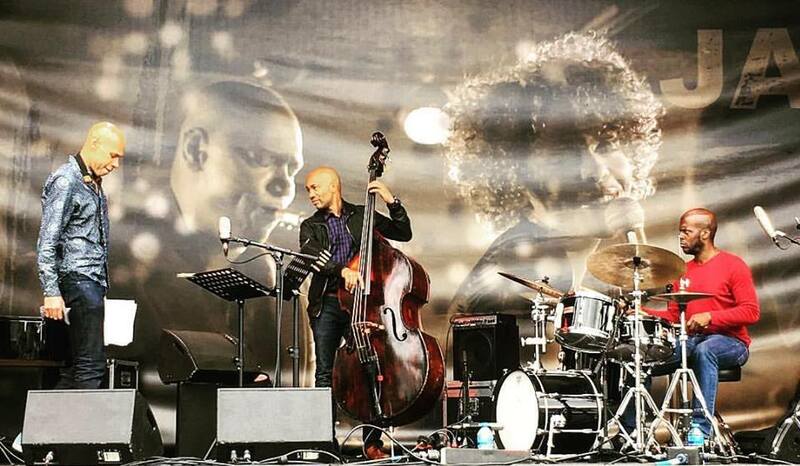 The organization has been changing the ambience of the great city Den Bosch entirely into an impressive jazz celebration fair by spreading the stages to almost all main streets and squares of the city for many years. Coming back to the Joshua Redman Trio, the musicians managed to captivate the audience starting from the first note and move just like three heavy-weight boxing champions in the ring. Despite the very informal and outdoor ambience in Den Bosch, the saxophonist Joshua Redman, the bassist Reuben Rogers and the drummer Gregory Hutchinson could easily lock all the attentions of concerned listeners to the tunes, which are selected mostly from unique arrangements of jazz standards and/or catchy compositions of Joshua as well as other jazz giants. A very interesting version of one of my all-time favorite tunes Mack The Knife became the first piece of the performance and getting Joshua's nice piece Second Date as the following one was something that makes me happier in my almost forefront seat in the middle of spacious Markt square. Blackwell's Message from Joe Lovano, Limehouse Blues from Django Reinhardt and many others had filled our ears and fed our souls especially thanks to Joshua Redman's really impressive full breath tone and Gregory Hutchinson's endless energy on beating the drum-set.